Daphne Foskett, Miniatures: A Dictionary and Guide, 1987, p.g.392, colour pl.31A. Leo R. Schidlof, The Miniature in Europe, 1964, vol.II, p.g.763 where described as ‘Excellent’. In 1784, Smart obtained the permission of the Court of Directors of the East India Company to travel to India and establish a portrait practice, where the present work was painted. India at that time was a source of enormous wealth for servants of the East India Company and there was a constant demand from rich Company officials for portrait commissions. Smart was not the only artist to seek his fortune in India in the late eighteenth century: others who travelled to India included Robert Home (1752-1834) and Johan Zoffany (1733-1810), to name but two. During his time in India, Smart became tremendously successful: his patrons included personnel of the East India Company, government officials and Indian princes. Smart spent nearly all his time working in the city of Madras, much to the relief of Ozias Humphry (1742-1810) – who had already established a practice in Calcutta, and was reportedly worried about the effect Smart’s presence would have on his commissions. The present work, like all works from Smart’s Indian period, includes the letter ‘I’ beneath the date and was described by Daphne Foskett in her publication Collecting Miniatures as being a fine example from Smart’s Indian period of work. Painting just short of a decade after his arrival in India, this 1794 portrait exudes confidence and vigour. As Ozias Humphry noted, he painted his sitter’s ‘without any flattery’, preferring to record every hair, mole and line etched on the faces of those who sat before him. The existence of a secondary version of this portrait in the Cleveland Museum of Art [no.35], offers a fascinating insight into Smart’s working practice. 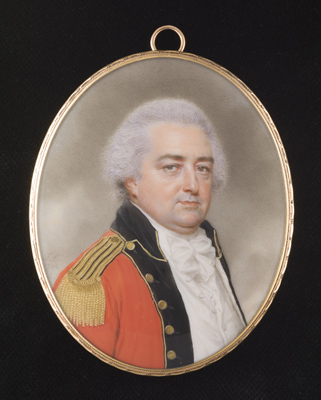 Portrait miniatures painted in India were often commissioned to send back to the sitter’s family in England – far more practical to send such a distance than a cumbersome oil portrait. For the expatriate living in India, sitting to Smart may have provided a welcome link back to British traditions, as well as an opportunity to assert social status and wealth. In 1798, a few years after the present work was painted, the diarist Joseph Farington wrote: ‘Smart says he has realised between 5 & £600 a yr. He now paints miniatures at 25 guineas a head’. The Cleveland version of this miniature is subtly different (it shows the sitter slightly closer to the viewer, with one button fewer shown) not least in lacking the signature, which would have denoted the primary, more expensive, ad vivum sitting. The identity of the sitter in the present work remains elusive, despite his evident rank and presumed wealth. The East India Company in the late eighteenth century maintained three different armies, in the three presidencies of Bengal, Madras and Bombay, and in none of them was military dress well-regulated enough, at the time this miniature was painted, to allow any firm identification of the sitter.